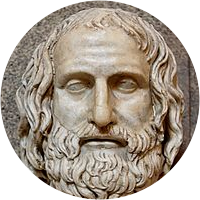 A collection of the best Euripides quotations. Love's all in all to woman. Woman is woman's natural ally. The lucky man passes for a genius. Every man is like the company he keeps. Reason can wrestle and overthrow terror. The wise men to follow their own course. Necessity is harsh. Fate has no reprieve. There is pleasure in hardship heard about. Ten thousand men possess ten thousand hopes. Not everything connected with old age is bad. A man's best possession is a sympathetic wife. Old age is not a total misery. Experience helps. What is ordained is master of the gods and thee. When good men die their goodness does not perish. Judge a tree from its fruit; not from the leaves. Those who are sad find somehow sweetness in tears. A few bear fruit in happiness; the others go awry. Money is far more persuasive than logical arguments. Bearing a child is worse than fighting three battles. We pay a high price for being intelligent. Wisdom hurts. one man now, but afterward another. A man's worth shines forth the brightest, who in hope confides. Youth is the best time to be rich; and the best time to be poor. This is courage in a man to bear unflinchingly what heaven sends. is courage in a man. Woman brings to man his greatest blessing and his greatest plague. It's not beauty but fine qualities, my girl, that keeps a husband. to bear unflinchingly what heaven sends. Here all mankind is equal: rich and poor alike, they love their children. Can make an outrageous wrangle. There is no jewel in the world so valuable as a chaste and virtuous woman. Neither earth nor ocean produces a creature as savage and monstrous as woman. The man who knows when not to act is wise. To my mind, bravery is forethought. I care for riches, to make gifts to friends, or lead a sick man back to health. We know the good, we apprehend it clearly. But we can't bring it to achievement. Keep alive the light of justice, and much that men say in blame will pass you by. The same man cannot be skilled in everything; each has his own special excellence. Time will explain it all. He is a talker, and needs no questioning before he speaks. To persevere, trusting in what hopes one has, is courage in a man. The coward despairs. Power gives no purchase to the hand; it will not hold, soon perishes, and greatness goes. When the anger of the gods is incurred, wealth or power only bring more devastating punishment. There is no worse evil than a bad woman; and nothing has ever been created better than a good one. That man is happiest who lives day to day and asks no more, garnering the simple goodness of a life. Time will discover everything to posterity; it is a babbler, and speaks even when no question is put. Oh, what a power is motherhood, possessing A potent spell. All women alike Fight fiercely for a child. Marry, and with luck it may go well. But when marriage fails, then those who marry lie at home in hell. Few have greater riches than the joy that comes to us in visions, in dreams which no man can take away. Enjoy yourself, drink, call the life you live today your own, but only that; the rest belongs to chance. Of all the evils that infest a state, a tyrant is the greatest; his sole will commands the laws, and lords it over them. Unblessed is the child who does not honor his parents; but if reverent and obedient to them, the child will receive the same from his own.